The Union Public Service Commission (UPSC) is likely to display the official communiqué as respect to Civil Services (Preliminary) – 2019 examination on 02.06.2019 its official website. The candidates who want to download the official notification need to wait for some more time. The all candidates and aspirants are briefed that the official notification of Civil Services (Preliminary)-2019 are published on the official website of UPSC. The online Applications can be filled up to 18th March, 2019 till 6:00 PM. The Union Public Service Commission (UPSC), As according to the official calendar of 2019 examinations created and published online by the UPSC at the official website, the competitors will be able to download the official notification for the Civil Services (Preliminary) – 2019 examination may apply online application from 19.02.2019 to 18.03.2019 through the official website. The Union Public Service Commission (UPSC) which is habitually known as UPSC is empowered by the Govt. of India with the aim to held the Civil Services Examination, Indian Forest Service Examination, Engineering Services Examination, Combined Defence Services Examination, National Defence Academy Examination, Naval Academy Examination, Combined Medical Services Examination, Special Class Railway Apprentice, Indian Economic Service/Indian Statistical Service Examination, Combined Geoscientist and Geologist Examination, and Central Armed Police Forces(Assistant Commandant) Examination. Civil Services Examination which is conducted by the UPSC is considered as one of the toughest examination of the world. Candidates and Aspirants from all over India in lakhs of numbers apply for this examination. The services in which candidates got selected considered very reputed job position in India. In 2019, UPSC has announced the official notification for the Civil Services (Preliminary) – 2019 examination and candidates in very large numbers have participated in the same examination and the result of which will be soon declared. In 2019 as according to the dates declared above, UPSC will transmit the official notification on its official website as early as possible. A candidate must have attained the age of 21 years and must not have attained the age of 32 years on the 1st of August, 2019 i.e., he/she must have been born not earlier than 2nd August, 1985 and not later than 1st August, 1996. Aspirants belonging to the reserved categories and want to get the benefits of the Relaxations of upper age limit as per the norms of Government of India shall to wait for the official notification to confirm the details. The candidates who want to apply for the Civil Services (Preliminary) – 2019 examination should have possessed degree from any recognized university or educational established as per the act of parliament. Candidates who appeared in the final year examination of degree and waiting for the result will also be eligible to apply for the Civil Services (Preliminary) – 2019 examination. Candidates (excepting Female/SC/ST/ PH who are exempted from payment of fee) are required to pay a fee of Rs. 100/- (Rupees One hundred only) either by depositing the money in any Branch of SBI by cash or by using net banking facility of State Bank of India/State Bank of Bikaner & Jaipur/State Bank of Hyderabad/State Bank of Mysore/State Bank of Patiala/State Bank of Travancore or by using Visa/Master Credit/Debit card. Candidates who are entitled to apply for the Civil Services (Preliminary) – 2019 will have to visit official website of UPSC. Candidates are advised to read out the whole notification carefully details by details of the Civil Services (Preliminary) – 2019 before applying for the examination. Candidates require confirming that they have valid E-Mail ID, Mobile Number, Scanned Copy of Photo and Signature which shall be required in further steps of registration of part-1 and 2. Locate the link of Part 1 registration for Civil Services (Preliminary)– 2019. 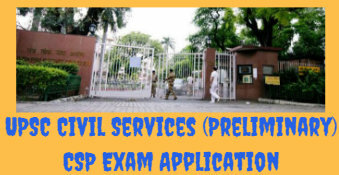 Click on the Part-2 Registration for Civil Services (Preliminary)– 2019. The candidates are informed that our hardworking team of will soon share all the details related to the recruitment notifications of UPSC Civil Services (Preliminary) – 2019, their Examination Dates, Examination Patterns, syllabus, e-admit cards, answer keys, cut-off marks and result exclusively here. So stay in touch with us. the examination. The e-Admit Card will be made available in the UPSC website for downloading by candidates. please inform me wbssc teacher jobs of 2018 if there is any information.